Do you know why I love that post, that mom, that show? Because she’s real. — Popular mom view. I haven’t showered in two days. My house is a wreck and there are no clean clothes to wear. My kids live off of frozen pizza, fast food and heat and eat meals. I yelled at my kids, didn’t teach them anything worth learning and told my husband to fix his own food. I live for the weekends when I can see my girlfriends. I feel trapped in this never-ending pile of laundry! Poop, spit-up and lack of sleep is what motherhood is really all about. Not only do they loudly proclaim the above, but then they throw in a curse word here or there to really spice things up. Or, they talk about such disgusting things that other people gag at the choice of words and descriptions while some moms roll on the floor laughing about her “realness.” Then the “real moms” mention that they had several glasses of wine to calm them down after a long, hard day of motherhood. But, wait? Do they feel guilty for any of this? But, what about other moms? I know many moms who I consider real-life examples of moms who excel at motherhood. As much as I can tell, these moms are definitely real. I have walked into their homes and their kids were dressed, dinner was in the oven and the mom was all smiles. I feel more than welcome in these homes and many times have chatted while the other mom sat down and nursed her baby. She was tired, but not frazzled or complaining about motherhood. However, the “real” moms call those same moms that I have come to respect and love, fake. The beds are typically made, but a little ruffled from tickle wars or kids learning how to do chores. Toddlers may be playing on the floor with blocks, and sippy cups may line the kitchen counter. It’s obvious kids live there, but the floors are not sticky and the kids are not running around naked — but those ladies are still real moms. If you are a Christian, I ask you to take a closer look at the Bible to know what God says about moms. God didn’t leave us in the dark when it comes to motherhood. In fact, he gave us some amazing examples, but I will just mention one for now. In Proverbs 31, we read about an awesome mother. Many times we know her as the “Virtuous Woman.” But, she wasn’t just a woman — she was a mother. Do you think she was fake? Absolutely not. What are some characteristics of the mother God calls a “real mom” who is virtuous or good? If we are honest with ourselves, we would admit this is not the popular “real mom” we hear about ever-so-frequently. Nope, in fact she’s the complete opposite. We can pout all day and claim that we can’t get our housework done and take care of our kids. We can also convince ourselves that making a home-made meal for our families is just too much work. But, I guarantee you, you wouldn’t convince the mother of Proverbs 31 that. In fact, she would say the opposite. She woke up before her family did and made breakfast. She chose not to be idle, lazy or a time-waster. She chose to speak with her husband, children, friends and neighbors with kindness. She chose to make herself coverings of tapestry and be dressed in silk and purple — not sweat pants for days on end. She knew her husband had to look at her every single day, and she chose to be beautiful for him. In fact, she was so well-known for goodness, that her husband was known in the gates. She was a crown to her husband, and he never had to be ashamed that she was his wife and the mother of his children. 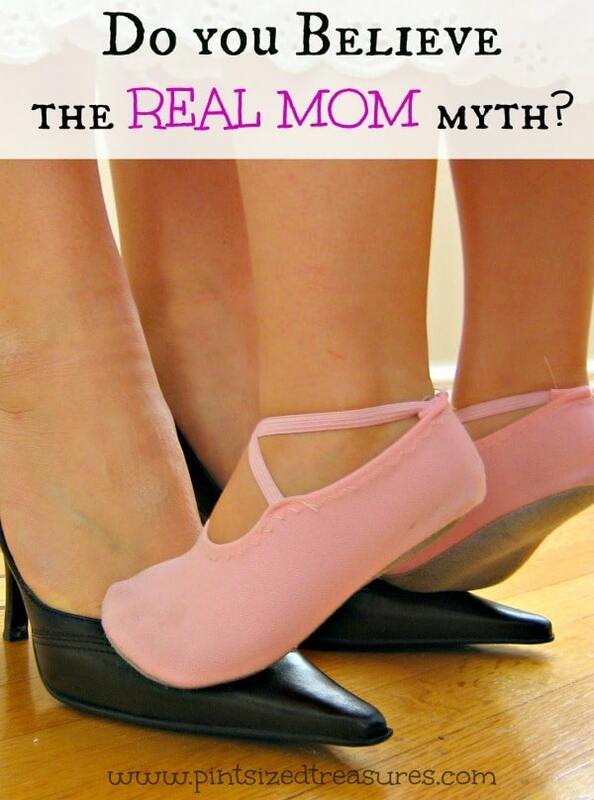 So, what do you think about the “real-mom” myths? You do have time to invest in getting a shower, getting dressed, cleaning the house, playing with your kids and yes — even cooking! If you feel pressed for time, try cutting back on your internet or TV time first. Then, consider waking up a little earlier or staying up a little later. Those simple changes will help you realize the time you do have available. I so desire for all of us moms to make the most of this short-time on Earth we call life. We only get to be moms once, and if we mess up, there is no turning back. I encourage you to read Proverbs 31 and see what a “real Mom” should be.